KIMCHIIIII! My newest addiction. Seriously - try it... you'll be addicted too, promise! Kimchi is a Korean dish consisting of spicy, crunchy veggies and salt. It can be eaten fresh or fermented, BUT fermented is the way forward - that way you can reap the benefits of immunity boosting, gut-loving good bacteria...and it tastes much better too! Traditional kimchi uses fish sauce to add a umami element to the dish - I replaced this with kelp powder and a little water, however I've heard of people using wakame (seaweed), miso paste and mushrooms - you could try one of these if you can't find kelp powder! I found it easy to locate all of the other ingredients, with the exception of the gochugaru chilli. This is a coursely ground red pepper with a texture in between flakes and powder. The flavour is hot, sweet and slightly smoky - this ingredient is essential for making kimchi - it cannot be replaced with 'normal' chilli flakes/powder. I found mine here on Amazon. Begin by preparing the cabbage - slice Chinese leaf length-ways into quarters and cut off the cores. Then cut across to make 2 inch bite-sized pieces. Next we will salt the cabbage. Find a large bowl - add cabbage and sea salt and begin to massage salt into cabbage pieces. Do this for a few minutes - until cabbage beings to soften, then fill the bowl with water until all pieces are covered. Place a plate with something heavy-ish on top of the cabbage - this will ensure all of the pieces are submerged in saltwater. Leave this to soak for 1.5 hours, turning every 30 minutes to ensure the pieces are evenly salted. Whilst cabbage is soaking, prepare kimchi seasoning. Add glutinous rice flour and ½ cup of water to a saucepan over heat, whisking continuously. When the mixture starts to become 'gluey' remove from heat and place in the fridge to cool down. Once cooled, add rice flour paste, garlic, ginger, onion, sugar, kelp powder (and 3 tbsp water) and gochugaru to a food processor. Blend until smooth. Once cabbage has soaked for 1.5hours, remove from bowl and rinse with cold water three times. Drain well (squeeze off extra water if necessary!) and place back into bowl. Add carrots and spring onions and pour over kimchi seasoning. Massage seasoning into the vegetables - you may want to wear rubber gloves for this part - until everything is well coated. Pack kimchi into mason jar ensuring that it's pressed down so the liquid covers the cabbage, leave about an inch of space at the top. 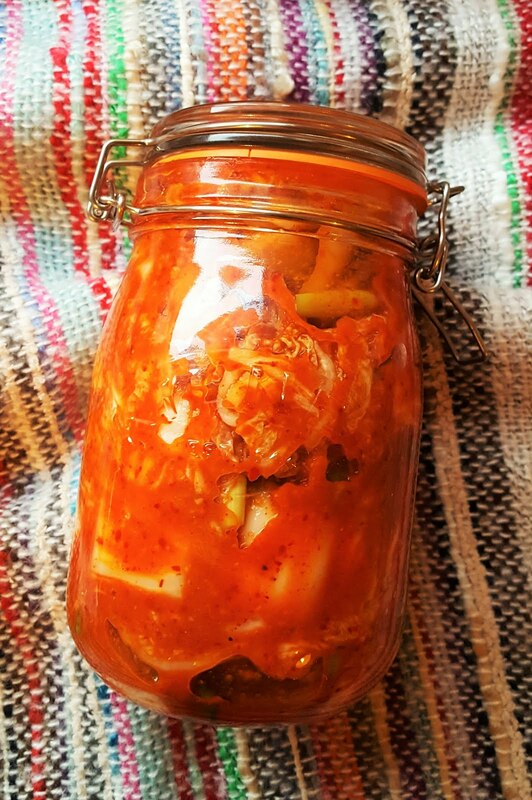 Leave the kimchi to ferment for two days on your countertop - you'll want to open the jar once or twice a day to allow it to breathe - we don't want any kimchi explosions happening. That would be bad. Very bad. Once the two days are up, place your kimchi jar into the fridge - this will slow down the fermentation process. Taste each day to decide when your kimchi has fermented to your taste - I left mine in the fridge for a week, so 9 days fermentation in total. Once your kimchi is ready enjoy as a side dish or just straight out of the jar as I did! So it's been the best week ever in the world of vegan cheese (GARY?! yes.) 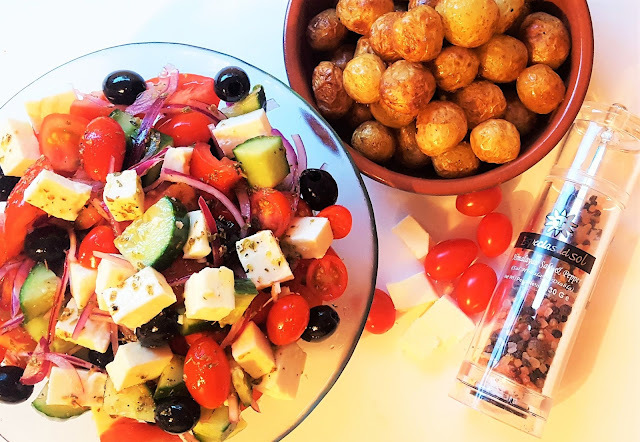 - Sainsbury's released SEVEN new dairy-free cheeses and most of them taste like the real deal. AMAZING TIMES. I highly recommend checking out the caramelised cheddar, Greek, Wensleydale with cranberry and garlic & herb soft style cheeses, you won't regret it. Begin by adding mini potatoes to a large pan. Cover with water and bring to a boil - we want to boil these until they are beginning to soften. While the potatoes are boiling, add 3 tbsp of olive oil to a casserole dish, preheat the oven to 220°and place the dish inside. When a knife can easily pierce through one of the potatoes, remove and strain all water off. Add potatoes to preheated casserole dish, season well and toss in the hot oil. Place in oven until crispy, remembering to turn after about 15 minutes. While potatoes are roasting, add the chopped vine/baby plum tomatoes to a bowl and sprinkle with salt - set aside. Then stir together extra virgin olive oil, lemon juice and oregano and set aside - this is our salad dressing. © the gentle lentil. All rights reserved.